Napoleon Bonaparte (15 August 1769 – 5 May 1821) was a military and political leader of France. He was also "Emperor of the French" as Napoleon I. His actions shaped European politics in the early 19th century. Bonaparte was born in Corsica. His parents were of noble Italian birth. He trained as an officer in mainland France. Napoleon became important under the First French Republic. He led successful campaigns against Coalitions of enemies of the Revolution. 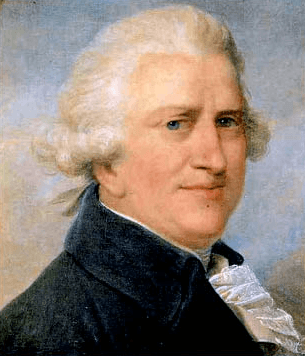 In 1799, he staged a coup d'état to make himself First Consul. Five years later the French Senate declared him Emperor. In the first ten years of the nineteenth century, the French Empire under Napoleon waged the Napoleonic Wars. Every European great power joined in these wars. After a number of victories, France became very important in continental Europe. Napoleon increased his power by making many alliances. He also made his friends and family members rule other European countries as French client states. 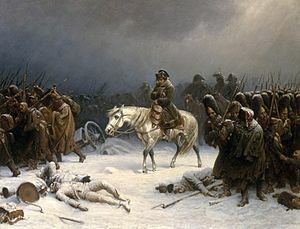 The French invasion of Russia in 1812 became Napoleon's first big defeat. His army was badly damaged and never fully recovered. In 1813, another Coalition defeated his forces at Leipzig. The year after that, they attacked France. The Coalition exiled Napoleon to the island of Elba. Less than a year later, he escaped Elba and briefly became powerful again. However, he was defeated at the Battle of Waterloo in June 1815. Napoleon spent the last six years of his life confined by the British on the island of Saint Helena. A doctor said he died of stomach cancer but some scientists think he was poisoned. Napoleon's campaigns are studied at military schools all over the world. He is remembered as a tyrant by his enemies. However, he is also remembered for creating the Napoleonic code. Although raised a Catholic, Napoleon was a deist. 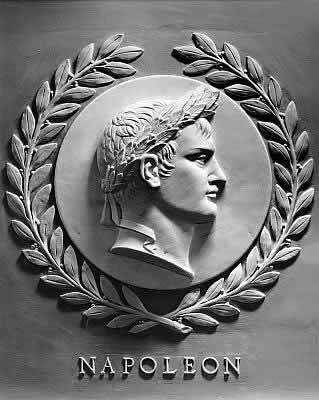 Napoleon Bonaparte was born in Casa Buonaparte in the town of Ajaccio, Corsica, on the 15th of August 1769. This was one year after the island was given to France by the Republic of Genoa. He was the second of eight children. He was named Napoleone di Buonaparte. He took his first name from an uncle who had been killed fighting the French. However, he later used the more French-sounding Napoléon Bonaparte. The Corsican Buonapartes were from lower Italian nobility. They had come to Corsica in the 16th century. 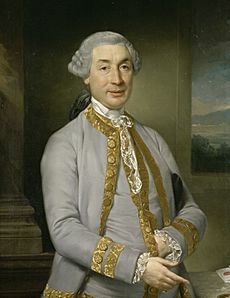 His father Nobile Carlo Buonaparte became Corsica's representative to the court of Louis XVI in 1777. The greatest influence of Napoleon's childhood was his mother, Maria Letizia Ramolino. Her firm education controlled a wild child. He had an older brother, Joseph. He also had younger siblings Lucien, Elisa, Louis, Pauline, Caroline and Jérôme. Napoleon was baptized as a Catholic just before his second birthday, on 21 July 1771 at Ajaccio Cathedral. Napoleon was able to enter the military academy at Brienne in 1779. He was nine years old when he entered the academy. He moved to the Parisian École Royale Militaire in 1784 and graduated a year later as a second lieutenant of artillery. Napoleon was able to spend much of the next eight years in Corsica. There he played an active part in political and military matters. He came into conflict with the Corsican nationalist Pasquale Paoli, and his family was forced to flee to Marseille in 1793. The French Revolution caused much fighting and disorder in France. At times, Napoleon was connected to those in power. Other times, he was in jail. In the French Revolutionary Wars he helped the Republic against royalists who supported the former king of France. In September 1793, he assumed command of an artillery brigade at the siege of Toulon, where royalist leaders had welcomed a British fleet and troops. The British were driven out in December 17, 1793, and Bonaparte was rewarded with promotion to brigadier general and assigned to the French army in Italy in February 1794. General Napoleon Bonaparte was later appointed by the republic to repel the royalists on October 5 1795. More than a 1400 royalists died and the rest fled. He had cleared the streets with "a whiff of grapeshot" according to the 19th-century historian Thomas Carlyle. He was then promoted to major general and marked his name on the French Revolution. The defeat of the Royalist rebellions ended the threat to the Convention and earned Bonaparte sudden fame, wealth, and the patronage of the new Directory. In March 9, 1796, Napoleon married Josephine de Beauharnais, a widow older than he was and a very unlikely wife to the future ruler. The campaign in Italy is the first time Napoleon led France to war. Late in March 1796, Bonaparte began a series of operations to divide and defeat the Austrian and Sardinian armies in Italy. He defeated the Sardinians in April 21, bringing Savoy and Nice into France. Then, in a series of brilliant battles, he won Lombardy from the Austrians. Mantua, the last Lombard stronghold fell in February 1797. In May 1798, General Napoleon left for a campaign in Egypt. The French needed to threaten British India and the French Directory was concerned that Napoleon would take control of France. The French Army under Napoleon won an overwhelming victory in the Battle of Pyramids. Barely 300 French soldiers died, while thousands of Mamluks (an old power in the Middle East) were killed. But his army was weakened by bubonic plague and poor supplies because the Navy was defeated at the Battle of the Nile. The Egyptian campaign was a military failure but a cultural success. The Rosetta Stone was found by French engineer Captain Pierre-François Bouchard, and French scholar Jean-François Champollion was able to read the words in the stone. Napoleon went back to France because of a change in the French government. Some believe that Napoleon should not have left his soldiers in Egypt. Napoleon helped lead the Brumaire coup d'état of November 1799. Bonaparte returned to Paris in October 1799. France's situation had been improved by a series of victories but the Republic was bankrupt, and the ineffective Directory was unpopular with the French population. He was approached by one of the Directors, Emmanuel Joseph Sieyès, for his support in a coup to overthrow the constitutional government. The leaders of the plot included his brother Lucien Bonaparte (the speaker of the Council of Five Hundred), Roger Ducos, another Director, Joseph Fouché, and Charles Maurice Talleyrand. Other deputies realised they faced an attempted coup. Faced with their protests, Bonaparte led troops to seize control and disperse them, which left a rump legislature to name Bonaparte, Sièyes, and Ducos as the three provisional Consuls to administer the government. Sieyès expected to dominate the new regime, but he was outmaneuvered by Bonaparte. Napoleon drafted the Constitution of the Year VIII, and secured his own election as First Consul. This made Bonaparte the most powerful person in France, and he took up residence at the Tuileries. In 1800, Napoleon ensured his power by crossing the Alps and defeating the Austrians at Marengo. He then negotiated a general European peace that established the Rhine River as the eastern border of France. He also concluded an agreement with the pope (the Concordat of 1801), which contributed to French domestic tranquility by ending the quarrel with the Roman Catholic Church that had arisen during the French Revolution. In France the administration was reorganized, the court system was simplified, and all schools were put under centralized control. French law was standardized in the Napoleonic Code, or civil code, and six other codes. They guaranteed the rights and liberties won in the Revolution, including equality before the law and freedom of religion. In February 1804, a British-financial plot against Bonaparte was uncovered by the former police minister Joseph Fouche. It gave Napoleon a reason to start a hereditary dynasty. On December 2, 1804, Napoleon Bonaparte crowned himself "Emperor of the French". The people of France did not see him as the monarch of the old regime because of his holding a Roman Empire title. He invited Pope Pius VII to see his coronation at Notre Dame Cathedral in Paris. During the ceremony, Napoleon I took the crown from the pope's hand and placed it on his own head. This had been agreed on between Napoleon and the Pope. At Milan Cathedral on May 26 1805, Napoleon was crowned King of Italy with the Iron Crown of Lombardy. To restore prosperity, Napoleon modernized finance. He regulated the economy to control prices, encouraged new industry, and built roads and canals. To ensure well-trained officials and military officers, he promoted a system of public schools under firm government control. He also repealed some social reforms of the revolution. He made peace with the Catholic Church in the Concordat of 1801. The Concordat kept the Church under state control but recognized religious freedom for Catholics. Napoleon I won support across class lines. He encouraged the émigré population to return, provided they gave an oath of loyalty. Peasants were relieved when he recognized their right to lands they had bought during the revolution. Napoleon's chief opposition came from royalists and republicans. Among Napoleon's most lasting reforms was a new law code, popularly called the Napoleonic Code. It embodied Enlightenment principles such as equality of all citizens before the law, religious toleration, and advancement based on virtue. But the Napoleonic Code undid some reforms of the French Revolution. Women, for example, lost most of their newly gained rights under the new code. the law considered women minors who could not exercise the rights of citizenship. Male heads of households regained full authority over their wives and children. Again, Napoleon valued order and authority over individual rights. Emperor Napoleon abandoned plans to invade England and turned his armies against the Austro-Russian forces, defeating them at the Battle of Austerlitz on December 2, 1805. In 1806 Napoleon destroyed the Prussian army at Jena and Auerstädt and the Russian army at Friedland. He crowned his elder brother Joseph Bonaparte as King of Naples and Sicily in 1806 and converted the Dutch Republic into the kingdom of Holland for his brother Louis. 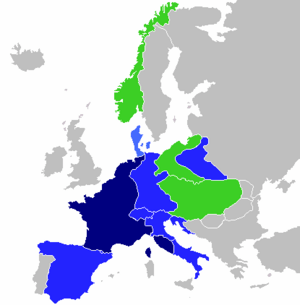 Napoleon also established the Confederation of the Rhine (most of the German states) of which he was protector. To legitimize his rule, he divorced his wife Joséphine and married Marie Louise, duchess of Parma and daughter of the Emperor Francis I of Austria. Soon she delivered a son and heir to the Bonaparte Dynasty. He was named Napoléon François Joseph Charles Bonaparte or Napoleon II and crowned King of Rome from his birth. At Tilsit in July 1807, Napoleon made an ally of Russian tsar Alexander Romanov and greatly reduced the size of Prussia. He also added new states to the empire: the kingdom of Westphalia, under his youngest brother Jerome, the duchy of Warsaw, and others states. The Congress of Erfurt sought to preserve the Russo-French alliance and the leaders had a friendly personal relationship after their first meeting at Tilsit in 1807. However, in June 23, 1812, Napoleon went to war with Russia. The French invasion of Russia defeated many Russian cities and villages, but by the time they reached Moscow it was winter. Due to the Russian army's scorched earth tactics, the French found little food for themselves and their horses. Napoleon's army was unable to defeat the Russians. The Russians began to attack. Napoleon and his army had to go back to France. The French suffered greatly in during Napoleon's retreat. Most of his soldiers never returned to France. His army was reduced to 70,000 soldiers and 40,000 stragglers, against more than three times as many Allied troops. Finally at the 1813 Battle of the Nations he was defeated by the Allies: Sweden, Russia, Austria, and Prussia. Napoleon had no choice but to abdicate in favor of his son. However, the Allies refused to accept this. 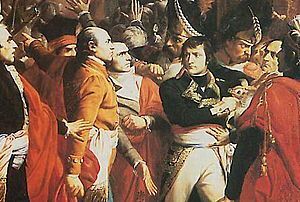 Napoleon abdicated without conditions on April 11, 1814. 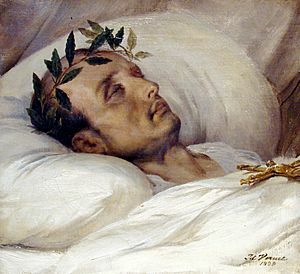 Before his official abdication, Napoleon attempted suicide with a pill but it did not work. In the Treaty of Fontainebleau the victors exiled him to Elba, an island of 12,000 inhabitants in the Mediterranean. The Allies allowed Napoleon to keep an imperial title "Emperor of Elba" and an allowance of 2 million francs a year. Napoleon even requested a 21 gun salute as emperor of the island of Elba. Many delegates feared that Elba was too close to Europe to keep such a dangerous force. Separated from his son and wife, who had come under Austrian control, cut off from the allowance guaranteed to him by the Treaty of Fontainebleau, and aware of rumours he was about to be banished to a remote island in the Atlantic Ocean, Napoleon escaped from Elba on February 26 1815. He made a surprise march on March 1, 1815 to Paris. His former troops joined him and Louis XVIII fled to exile. He again became ruler of France for a length of 100 days. Napoleon was defeated at the Battle of Waterloo by the British under Duke of Wellington and Prussians on June 18 1815, which was his last battle. Napoleon was again captured and taken to his second exile on the island of Saint Helena on the Atlantic Ocean. Napoleon was sent to the island of Saint Helena, off the coast of Africa. He died on May 5 1821 of stomach cancer. Napoleon kept himself up to date of the events through The Times and hoped for release in the event that Holland became Prime Minister. There were other plots to rescue Napoleon from captivity including one from Texas, where exiled soldiers from the Grande Armée wanted a resurrection of the Napoleonic Empire in America. There was even a plan to rescue him with a primitive submarine. For Lord Byron, Napoleon was the epitome of the Romantic hero, the persecuted, lonely and flawed genius. The news that Napoleon had taken up gardening at Longwood also appealed to more domestic British sensibilities. On the world stage, Napoleon's conquest spread the ideas of the revolution. He failed to make Europe into a French Empire. Instead, he sparked nationalist feeling across Europe. "Kiss the feet of Popes provided their hands are tied." Napoleon's father Carlo Buonaparte was Corsica's representative to the court of Louis XVI of France. The Coronation of Napoleon by Jacques-Louis David in 1804. Napoleon at the Battle of Wagram, painted by Horace Vernet. First remittance of the Légion d'Honneur, 15 July 1804, at Saint-Louis des Invalides, by Jean-Baptiste Debret (1812). Napoleon Facts for Kids. Kiddle Encyclopedia.